Have you ever felt you were part of a group that experienced something truly special? That’s how I felt last night, for so many reasons. 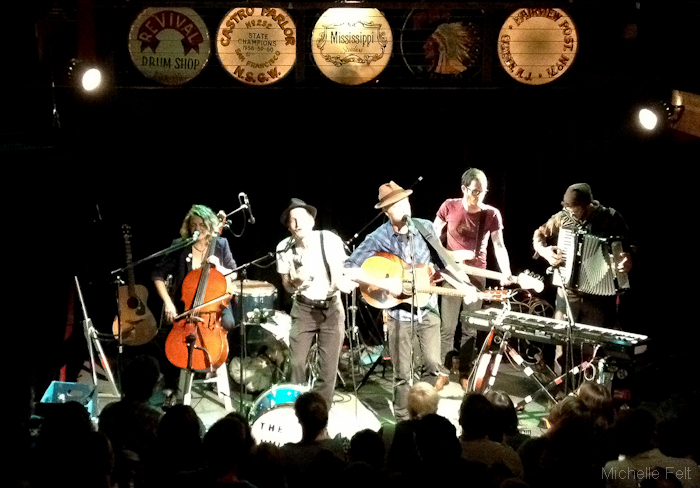 The Lumineers and their opening acts put on a glorious show, last night, March 30, 2012, at Mississippi studios. I think it was December when I first heard the song “Ho Hey”. It may or may not have been on the CW TV show, Hart of Dixie (puts hand in front of mouth and blushes while looking down). Guilty. The song played over the last few minutes of the episode and was a perfect overlay showing the ‘hit & miss’ of the leading relationships. I can’t say that feeling happens very often, that manic feeling, of needing to know a song and the where’s and why’s. So when it does, I pay attention. Since then I’ve re-shared this unofficial but lovely music video from a year ago on facebook. Many times. The only other song I feel compelled to share like that is TV on the Radio’s ‘Wolf Like Me’. What can I say? Have I mentioned I almost didn’t make it to the concert? I bought my lone ticket at the beginning of March when I found out. See I go on these binges, every couple of weeks, watching/listening to their songs on vimeo and then looking up if they are playing in Portland soon. I was surprised my timing lined up so well with our return from IL and in advance enough, that tickets were still available. See, there was this other thing too, I knew Jeremy would be traveling for work and I debated at the time if I would really go by myself or convince others to go with me. Tickets were only $10 so I said, wth. Yesterday, I went back and forth a million times, literally, about going or not going. There’s just something not very exciting about going alone to a concert via public transportation to an area of town you are not familiar with. Hence, I decided in the afternoon I wouldn’t go and texted Jeremy “that I just couldn’t see going”. About an hour later I found myself getting ready and putting on my shoes and talking myself up. Calling him in the process to share my change of heart. I would for sure be a ‘shut-in’ if I wasn’t constantly battling that mentality – thank goodness for my strong constitution. I can’t even begin to tell you the games I play in my mind to pump myself up, telling myself I can do this. Leaving the house and heading for the MAX and then the bus, I felt great, the hardest step is walking out the front door. I also had my peppermint altoids and crystalized ginger, which seem to help with any anxieties I feel. Side note: Most people would never guess that I’m anxious inside – I hide my vulnerabilities well because I never want them to win. haha. I don’t want to dwell on this part of the trip, but I’ll say I felt great on the bus ride, not so great at Laughing Planet Cafe (I ate half my salad and only drank 1/2 of my porter beer – oh well) and almost thought about getting back on the bus while it was still light out (this happened a few times), and then walked down and figured out where the studio/bar was before walking inside. It was packed and became even more so! I wasn’t ordering a drink or planning to eat which was good as ALL the tables were full. I didn’t feel like there was any place to stand without getting in the way, so I stood near the sign, pictured above and that is how I became the first person in line. Doors opened a little after 8 and it seemed like many of the people at least the 4 behind me came right up to the balcony where I was headed, we all got front row seats. I love the balcony area at general seating venues. It keeps me out of the crowd (my days of mosh pits may be over) and able to sit at a table, lean on a railing or in this case grab a front row center seat. Time to relax. Finally. I began talking with the couple next to me and quickly discovered we both learned about the Lumineers through Hart of Dixie and had the same reaction talking about a show we both adore; with a little embarrassment and chuckles. We then converged on topics of food (of course), vegetarianism, local eats, jobs (we all share a govt/utility background – crazy! ), and general life/music musings. I loved talking to you two! This wonderful couple also offered to give me a ride home if the show ran after 12, reassuring me they weren’t crazy or creepy. It’s sad that our first inclination is to not want to trust others, I went with my gut and the reassurance of our good conversations and trusted them as much as they trusted me and took them up on their offer. There are good and wonderful people in this world – you should all go out and meet some. They got me home ‘safe-fully’, in the childhood words of my husband and in about 5-8 minutes time instead of 40+ minutes of waiting at bus stop by oneself and waiting at another bus stop or MAX station in similar fashion at almost 1 in the morning. Thank you guys for that! The concert is all about the experience and that was one of the highlights for me, but there is still music to discuss! I’m not a singer or even musically inclined but I know what I enjoy and when I do enjoy, it is with revel. The opening acts were ‘solo’ singers from other bands, although the 2nd act convinced his band to play with him – haha. The first up was Matt Bishop from Hey Marseilles. He was a very good singer and guitarist, I loved all the songs, but I was still a little anxious at this point and found it not enough to distract. Shame on me! I look forward to checking his band out more. Second up was, Sean Spellman of and with Quiet Life. Fantastic! Distraction happened and I was really starting to enjoy myself and already feeling grateful I had made it this far. There was a slide guitarist, I think, guitars, harmonica and drums. The slide guitar lent itself to some incredibly haunting and magical tunes – my favorite. The lead singer reminded me of Bob Dylan but in his own way, just a really rich and wonderful voice. I really enjoyed them and will definitely be looking into their music. Finally. The band I traveled oceans of anxieties and self doubt to see. I’m so dramatic aren’t I? But, that’s what it felt like. They were beyond amazing and filled the room with rich musical tones that make you want to get up and effing dance! Even in a balcony with a low railing, hence I did not. Instead I wiggled my foot like crazy and swayed my shoulders in time. 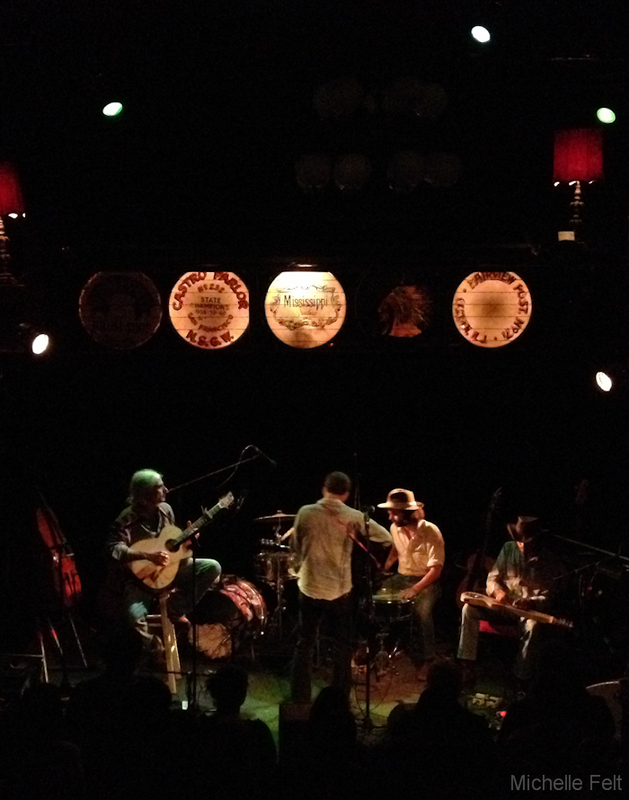 Every chord and stroke of the guitar, violin, cello, piano, tambourine and drums were beautiful. I already knew I liked a few other of their songs, based on my vimeo watching experience and definitely loved everything I heard last night. There is something to be said about seeing truly talented musicians in a small and intimate venue. Everything about it seems magical and dear. I feel very special that I got to see and experience them in such a setting. I have a feeling their venues will get just a bit larger with time. 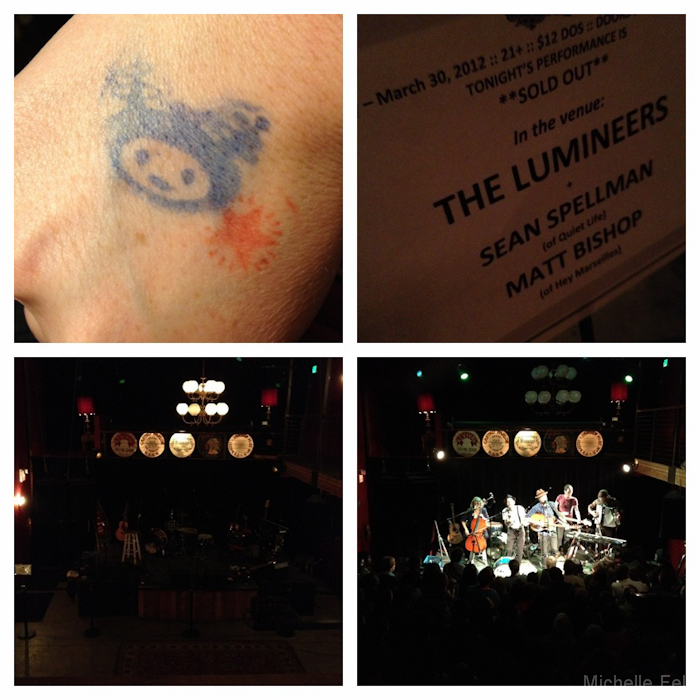 Thank you Lumineers, Matt Bishop, and Quiet Life for a memorable ‘solo’ going concert experience!